Born in Lowenstein [Germany] and educated in Stuttgart and Karlsruhe, Manuel Wielandt is an enigma to most post card collectors who enjoy artist drawn views and scenes. He never intended to be a postcard artist, but for more than a decade after his formal studies, he traveled the Continent and used his time and talents to make beautiful pictures in the eternal cities where European heritage and culture made their priceless contributions to Western civilization. Wielandt worked primarily in Southern Europe, yet partially in Switzerland and Germany. 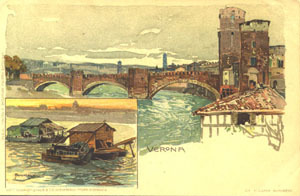 His favorite places included the French and Italian Riviera and the cities within the Italian region known as the Veneto. It is generally acknowledged by post card historians that Wielandt created the pictures but it was the publishers in Germany who created the "Wielandt Postcard." Another bit of acknowledged postcard history is that there are exactly 106 Wielandt postcards: four sets of 25 each and one set of six. The four sets of 25 which make-up the 100 cards showing southern European beaches, ports, cities, churchs, and social history are the focus of this checklist. * There is constant concern among Wielandt collectors about the numbers. The numbers which reference the cards in this checklist are generally considered the standard. In most of the printing versions the numbers are found on the front of the card, along an edge, printed in very light, grey ink and are extremely difficult to read. A magifier is a must to read them except those with very young eyes.